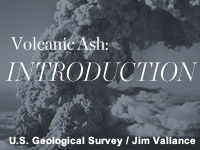 Provides a concise introduction to volcanic ash through the examples of the Mt. Pinatubo and Eyjafjallajökull eruptions. This is the introduction to a four-part series on Volcanic Ash. I first saw this course about 3 weeks ago and thought it looked interesting. I started this morning and found it just so. It is very well put over and at present quiote easy for me, ( not scholarly, but learning late in life)Very informative. Extremely informative and well presented, gives a good foundation for the following modules. The learner will be able to describe the Eyjafjallajokull and Mount Pinatubo's eruptions and their impacts to aviation, climate, maritime operations, and society. November 6, 2013: All media assets in this lesson have been updated for current browsers and mobile devices.